Have you ever seen a vampire squid? Did you know that the proboscis monkeys are born with blue faces? Would you like to take a close look at a water dragon's eye? This book contains a huge amount of interesting things to read and learn about a wide range of animals. It is diveded in four parts, Strange, Unusual, Gross and Cool, although many animals are all these things at the same time! And the pictures are wonderful and abundant. I found this book surprisingly absorbing. It is all a curious kid would enjoy. The facts are punctual and concrete. The text accessible for the age range. To make the content more clear some animals are joined according to one feature, like "Venomous Creatures" or "Newly Discovered Cratures", while some other are portrayed individually for a deeper view, as in chapter such as "Thorny Dragon" or "Blue-footed booby". And again, the photography is amazing. 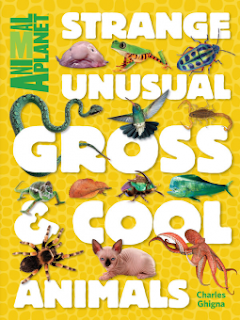 A strange, unusual, gross and cool addition for the non fiction shelf!